Today is one of those rare days where you can see a lots of 1s in the date i.e, 11/11/2011. 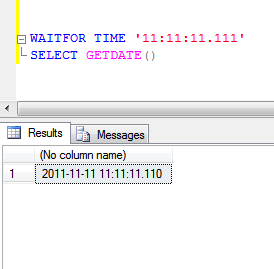 To add to that, the clock ticks 11:11:11 everyday, so I planned to capture the SQL Server datetime value returned by GETDATE() function. As I have to execute GETDATE() function at that exact moment, which is very unlikely, I used WAITFOR TIME statement as shown below.. This entry was posted in General, Scripts and tagged Fun, Scripts, WAITFOR by Brumedishetty. Bookmark the permalink.